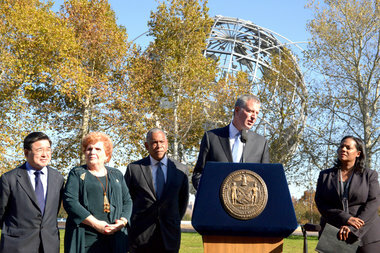 The mayor announced the alliance Monday in front of the historic Unisphere. CORONA — Flushing Meadows-Corona Park will finally have "the support to live up to its legendary status" with the formation of a public-private alliance, Mayor Bill de Blasio said Monday at its announcement. He introduced the Flushing Meadows-Corona Park Alliance, with the historic Unisphere as the backdrop, alongside Councilwoman Julissa Ferreras-Copeland, who helped broker the $10.05 million deal with the United States Tennis Association in 2013. They're the inaugural funders of the group, de Blasio said, and he encouraged other businesses to invest in the borough's "crown jewel" through the alliance. “Flushing Meadows-Corona Park is a pivotal destination for so many of our Queens residents and tourists from around the world, and this alliance will ensure it continues to draw in visitors for years to come," de Blasio said. The alliance's formation was first announced by DNAinfo New York last week after previously reporting on its long delay. Copeland-Ferreras, who grew up in Corona, spoke about her perspective as a girl from the community — who learned how to ride a bike, had her prom and later the first date with her husband inside Flushing Meadows-Corona Park. "When I challenged myself to start this conservancy, I'm doing it for all those New Yorkers, those that live across the street, those that live in Jackson Heights, those that live as far as Far Rockaway," she said. "This park is the world's park, it is our park." The Alliance will work to distributed the USTA funds, and will also act like alliances at other parks, including Prospect and Central, to raise additional money. Janice Melnick, the Parks Department administrator for Flushing Meadows-Corona Park, will serve as the executive director for the board. It will be made up of business, government and community leaders, including Carol Conslato, the Director of Public Affairs for Con Edison; Javier Valdes fro Make the Road New York; Andrew Hirsch, the general counsel for USTA and lawyer Jim Haddad, who is also on the Queens Library Board of Trustees. The board also has five "ex-officio" members: First Deputy Mayor Anthony Shorris, Parks Commissioner Mitchell J. Silver, Acting Cultural Affairs Commissioner Edwin Torres, Speaker Melissa Mark-Viverit, and Queens Borough President Melinda Katz. A Community Advisory Board, set to meet in December, will gather community members who can select someone to serve on the board. As per the deal, the USTA will start distributing funds 21 days after the board is officially formed. That money was in limbo since 2013 as it awaited the formation of the board, which was delayed by the de Blasio administration for reasons the mayor could not say. He praised Ferreras-Copeland for her dedication to the alliance, noting "she's been working on this for years." But when asked about why it took so long, de Blasio deferred questions to Ferreras-Copeland — saying he "didn't know that history from the previous administration so the council member will speak to that." "With all due respect, we focused on getting this done, we’re very proud it’s done," added de Blasio, who was the public advocate during the Bloomberg administration.